A new Lord Peter Wimsey novel, what a treat! Jill Paton Walsh has successfully completed a couple of manuscripts left by Dorothy L Sayers & now she has created a completely new story using Sayers’s familiar characters. 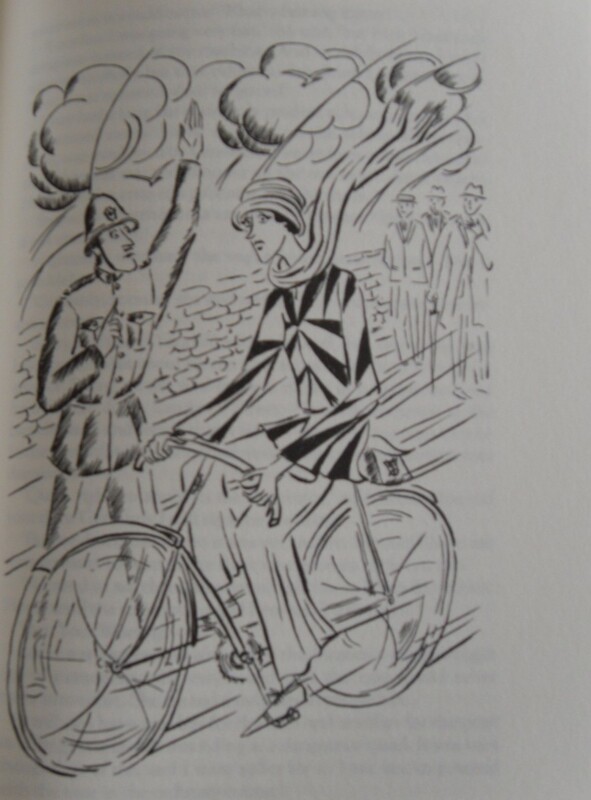 The previous Wimsey story, A Presumption of Death, was set during WWII. Now, in The Attenbury Emeralds, it’s 1951. Peter Wimsey is 60, still blissfully happy with Harriet, his detective writing wife. They have three sons, live in London & still own the country house, Talboys, that Peter bought for Harriet as a wedding present & where they spent their honeymoon in Busman’s Honeymoon. Peter’s mother, the Dowager Duchess, is still her inimitable self at 85. Bunter hasn’t changed a bit or grown a day older & lives in with his wife, Hope, & son Peter, known as PB. Peter is reminded of his first case, the disappearance of the Attenbury emeralds, by the obituary of Lord Attenbury. It was 1921, Wimsey had returned from the trenches in a nervous mental state & the house party at the Attenburys was to be his first foray into Society. The Attenburys were family friends & it seemed to be the perfect opportunity to test the extent of Wimsey’s recovery. The occasion for the house party was the announcement of the engagement of the eldest daughter, Charlotte, to Reggie Northerby. At dinner on the first evening, Charlotte was to wear the family jewels, a suite of emeralds with an enormous square-cut emerald as the centrepiece. The emerald could be worn as part of a necklace or as a tiara & had a Persian inscription on the back. The Attenburys are surprised to receive a visit from Mr Nandine Osmanthus, an envoy from an Indian Maharaja wanting to buy the emerald. The Maharaja owned the pair of this one & Wimsey sees the jewel, almost identical to the Attenbury’s emerald except for the inscription on the back. Lord Attenbury refuses to sell & sends Osmanthus off pretty smartly. That night, when Charlotte goes to her room to dress for dinner, she discovers the emerald is missing. She appears at dinner wearing the paste replica of the jewels that was kept in the house as the real emeralds were kept at the bank & only brought out on special occasions. But, the theft can’t be kept secret & Wimsey begins investigating, hindered by heavy-footed Inspector Sugg & helped by Charles Parker, later an Inspector at Scotland Yard & brother-in-law of Peter. Peter eventually tracks the jewel down to a pawnbroker & discovers that Reggie Northerby had pawned it. Charlotte breaks her engagement but Northerby isn’t prosecuted for the theft & everything seems to have been successfully hushed up. A few days after Wimsey & Bunter have told Harriet the story, the present Lord Attenbury, grandson of the old Lord, appears asking for Peter’s help. The authenticity of the emerald in the bank has been questioned. Attenbury is desperate to sell the emerald to save the family home but nothing can be done until the disputed provenance is settled. Peter agrees to investigate as someone has turned up claiming that the emerald in the Attenbury’s bank is not their emerald & can prove it. The emerald is certainly authentic but how could it have been swapped for another? Is this the Maharaja’s emerald that Peter saw all those years ago? There was no opportunity for Mr Osmanthus to have swapped the stones & the emerald has only been out of the vault a few times since. Peter follows the trail back over the years, talking to the family & anyone else who had access to the jewel. He discovers some accidental deaths that now seem less accidental & more sinister. Then he discovers that there were originally three emeralds & the Maharaja will do anything to reunite them. This is a wonderful mystery story. I loved meeting up with Peter, Harriet, Bunter, Charles Parker, the Duke of Denver & his snobbish Duchess. 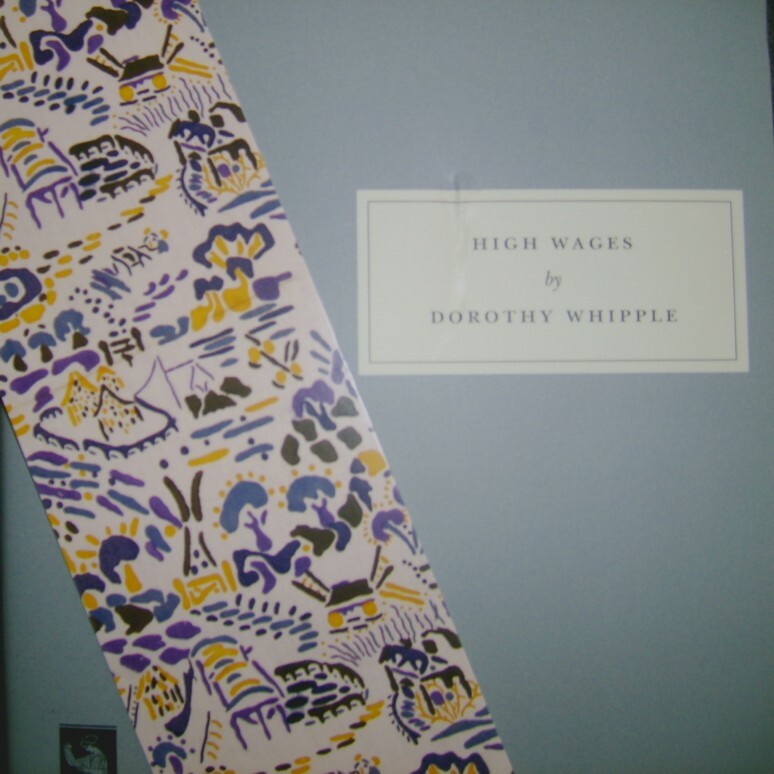 Jill Paton Walsh has immersed herself in Dorothy L Sayers’s work & doesn’t strike a wrong note throughout. Peter & Harriet trade quotations & sleuth as energetically as they ever did. This is a real treat for fans of the Wimsey stories who have read the series over & over again (as I have) & are thrilled to have a new story to enjoy. This is my last post for 2010. Happy New Year to everyone who visits the blog. I'll be back tomorrow with some reflections on my first year as a blogger & some reading resolutions for 2011. My favourite Non Fiction books of the year fall into one of these four categories. I often find that history & biography are hard to seperate as I read very little contemporary biography so the biographies I do read tend to be of historical figures. Letters & diaries are either from a historical period I'm interested in or written by an author whose work I enjoy. 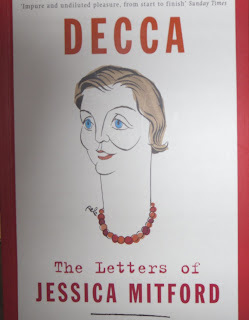 Decca, the letters of Jessica Mitford, was one of the many books by the Mitford sisters I read this year. 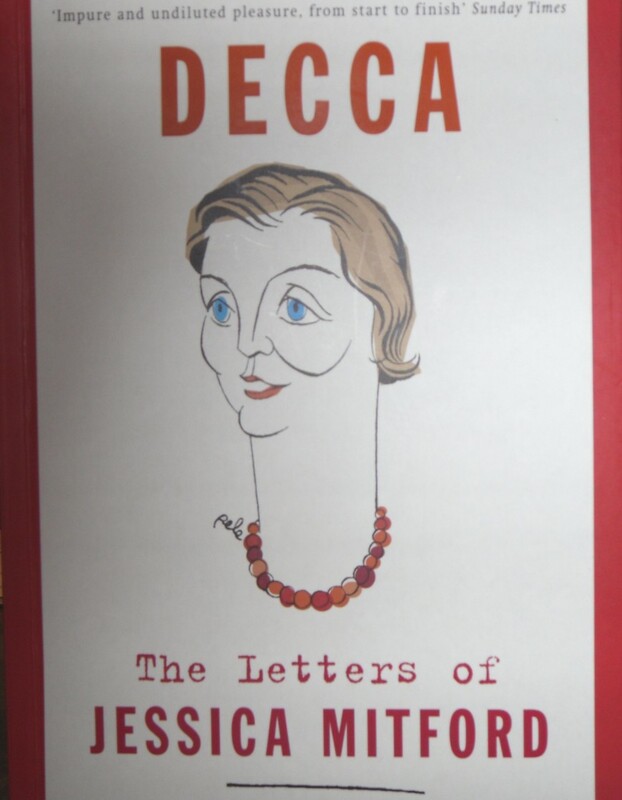 Jessica is the most likeable & sympathetic of the sisters to me & I loved reading her letters. 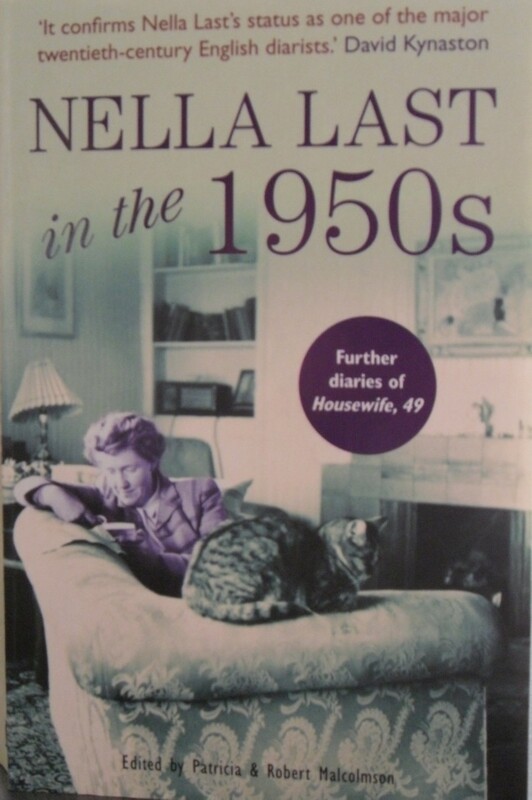 Nella Last is now one of the best-known diarists of WWII. She wrote her diaries for Mass Observation & kept writing after the War almost until her death. 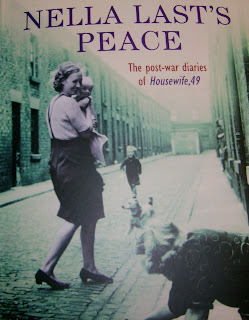 I read her WWII diaries a few years ago & this year read two more volumes, Nella Last's Peace & Nella Last in the 1950s. Alice Dudeney was one of my discoveries this year. A browse through an anthology of diarists led me to A Lewes Diary by Mrs Henry Dudeney. A famous novelist in her day, Alice is now completely forgotten. Her diary was rescued from the archives of a local Archaeological Society. I was completely absorbed in her life & tortured marriage. I'll list my favourite history & biography chronologically. Eleanor Butler is one of those shadowy medieval women who often slip through the cracks except when their story impinges on great events like the accession of Richard III. John Ashdown-Hill's biography, Eleanor, the Secret Queen, rescues her from that obscurity. The Days of Duchess Anne by Rosalind K Marshall was a book I'd had on the tbr shelves for years. 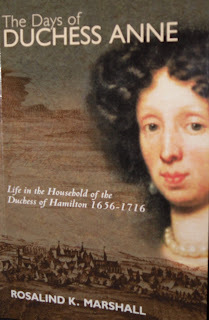 I loved reading about the household of the Duchess of Hamilton & life in Scotland in the late 17th century. Effie : A Victorian Scandal by Merryn Williams is the story of a marriage that went spectacularly wrong. 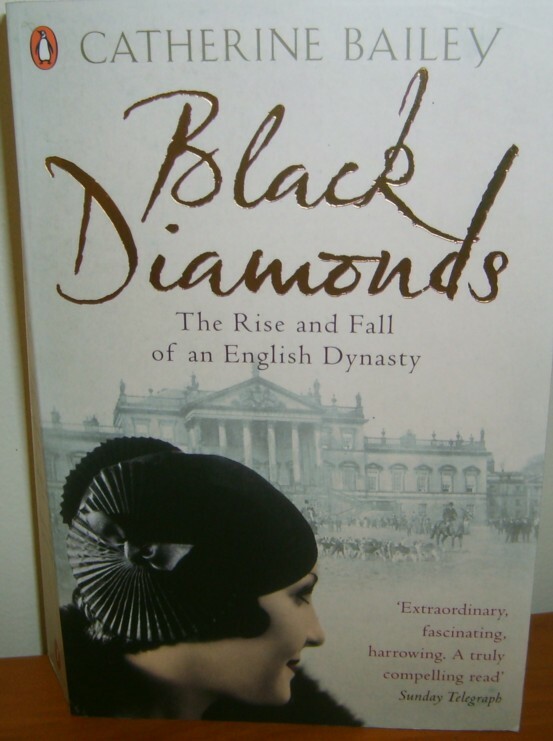 Black Diamonds by Catherine Bailey is the story of the Fitzwilliam family of Wentworth House & the coal mines that created their fortune. A wonderful example of social history taking in the Fitzwilliams & their workers. Well, there's my list of best books of the year. I can't wait to read your comments & visit my favourite blogs & read about everyone else's favourites. 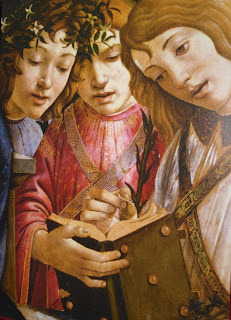 Here's to another great year of reading in 2011. I’m always interested to read books about lesser-known characters in periods I’ve read a lot about. I’ve read countless books about Henry VIII, his six wives, Mary, Queen of Scots & Elizabeth. 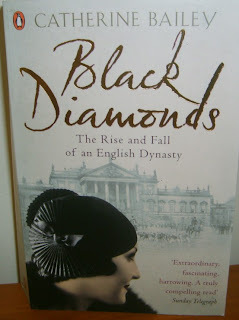 In recent years I’ve enjoyed books about Henry Howard, Earl of Surrey, Elizabeth Raleigh & Bess of Hardwick. Not the usual suspects. Desmond Seward’s new book is about the Yorkist pretenders to the throne who disturbed the peace of Henry VII & Henry VIII. As Shakespeare said, “Uneasy lies the head that wears a crown.” Henry Tudor defeated Richard III at the Battle of Bosworth in 1485 & almost immediately his flimsy claim to the throne was under attack from those loyal to the House of York. Henry’s claim was based on the illegitimate Lancastrian descent of his mother, Margaret Beaufort, & he was reluctant to admit that his marriage to Elizabeth of York was a way of strengthening this claim. Rumours about the fate of the Princes in the Tower, Edward V & Richard, Duke of York, had contributed to the downfall of Richard III, who was widely suspected of murdering them. The uncertainty about their fate would have repercussions throughout the reign of Henry VII. Richard III’s nephew, John de la Pole, Earl of Lincoln, was another pretender to be feared. Richard had made him his heir after the death of his own son & within two years of Bosworth, Henry was forced to confront Lincoln at the Battle of Stoke. Lincoln was killed but Henry could not rest easy as almost immediately a young boy called Lambert Simnel appeared, claiming to be Edward, Earl of Warwick, another nephew of Richard III. Henry knew that Warwick was safely imprisoned in the Tower of London but Simnel was taken to Ireland where there were many Yorkist supporters & he was proclaimed King. Henry had little trouble quashing this attempt & he realised that Simnel was just a pawn in the hands of ambitious men. He put the boy to work in his kitchens rather than executing him. Henry wasn’t always so merciful. The next pretender was much more dangerous. Perkin Warbeck claimed to be Richard, Duke of York, who escaped when his brother was murdered by Richard III’s henchmen & made his way to Burgundy. Here he was taken up by Margaret, Dowager Duchess of Burgundy, a sister of Richard III. Margaret hated Henry & would be a thorn in his side for years as she encouraged any Yorkist pretender who came her way. Warbeck was certainly an enigma. He had a certain resemblance to his supposed father, Edward IV, spoke good English & knew a considerable amount about life at the English Court. Henry accused Margaret of training Warbeck but he was also acknowledged by other rulers. James IV of Scotland supported him, marrying him to one of his relatives, Lady Katherine Gordon. James wasn’t averse to tormenting Henry as the Scots & the English hated each other but he does seem to have believed that Warbeck was the Duke of York. Unfortunately, Warbeck’s “subjects” objected to an army of Scots & other mercenaries pillaging & stealing on their way south from Scotland & Warbeck’s attempts foundered through bad planning, bad luck & lack of money. He was finally captured by Henry & imprisoned in the Tower with the young Earl of Warwick. Henry was content to let both young men rot in the Tower until he decided to marry his son Arthur to the daughter of Isabella & Ferdinand of Spain. The Spanish monarchs were reluctant to let their daughter marry into a dynasty so insecure on the throne. Henry decided Warwick must die & fabricated a conspiracy that embroiled Warwick & Perkin Warbeck as well. Both men were executed in 1499. As one White Rose (the symbol of the House of York) was cut down, others took their place. The Earl of Lincoln’s brothers, the de la Poles, plotted against Henry VII & Henry VIII, with the help of their Aunt Margaret in Burgundy & other Yorkists in England. Richard de la Pole was the most formidable of these brothers. He spent most of his life in exile in Europe but was a formidable soldier & had the backing of the King of France. Lack of money was his problem as well as the fact that he was only ever a pawn in the ambitions of European monarchs who wanted to get the better of Henry VIII. His death, fighting for the King of France at the Battle of Pavia in 1516, delighted Henry VIII. The Earl of Warwick’s sister Margaret had been married to a Tudor sympathiser, Richard Pole. Margaret was initially quite a favourite of Henry VIII. He restored some of her property, created her Countess of Somerset in her own right & made her governess to his daughter, Mary. She was very close to Mary & Katherine of Aragon & it was Henry’s attempt to divorce Katherine & renounce the authority of the Pope that led to a breach between Margaret & the King. Margaret’s sons, Richard, Geoffrey & Reginald would all inspire plots to depose Henry VIII & replace him on the throne with his daughter, Mary, who would marry one of these cousins & restore the Catholic faith to England. The Yorkist cause had become entwined with the desire of many people to turn back the religious changes Henry had made. Henry’s paranoia eventually led to Margaret’s imprisonment in the Tower & she was eventually executed on a trumped-up charge in 1541 at the age of 68. 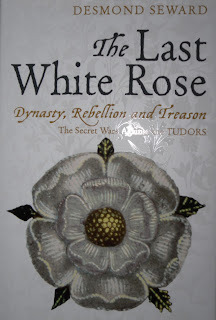 The Last White Rose is the fascinating story of all these pretenders to the throne. Several of the conspiracies almost succeeded. How different the history of England would have been if that had happened. I discovered several new authors this year & read new instalments in some favourite series. The Serpent Pool by Martin Edwards is the latest in his Lake District series & I'm looking forward to the next book, The Hanging Wood, in the New Year. This series has everything I enjoy in a mystery. 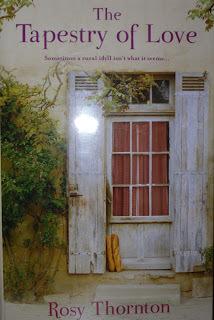 Atmospheric setting, great plot & a relationship between the main characters that has me on tenterhooks. Ann Cleeves's award-winning Shetland Quartet had somehow passed me by until this year when I read the last book, Blue Lightning, first. I've since gone back to White Nights & Raven Black. Again, a great location & intriguing characters made these books highlights for me this year. Elly Griffiths was another new author for me this year. I read the first two books in her series about Ruth Galloway, forensic anthropologist & can't wait for the third to be published next year. Here are links to my reviews of The Crossing Places & The Janus Stone. I've decided to borrow Cornflower's idea of choosing my favourite books in different categories instead of a straight Top 10 of the year. I've read about 150 books this year (& it's not over yet!) & there have been some wonderful reads among them. Just click on the links to go to my original posts. 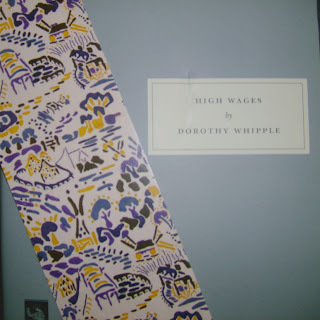 My favourite Persephone book of the year was High Wages by Dorothy Whipple. The story of Jane Carter's rise from draper's assistant to dress shop owner & a wonderful picture of provincial English life in the early 20th century. Unputdownable. 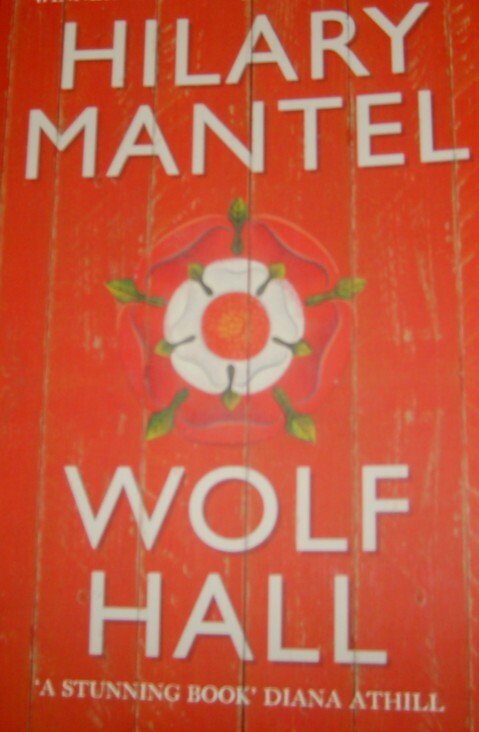 Wolf Hall by Hilary Mantel. I don't need to say much about this. 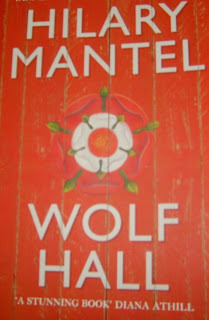 Booker Prize winner, fantastic historical novel about Thomas Cromwell & the Court of Henry VIII. The Tapestry of Love by Rosy Thornton. I loved this story of a divorced Englishwoman in her 40s moving to a village in the Cevennes & creating a new life. Then there were the classics. 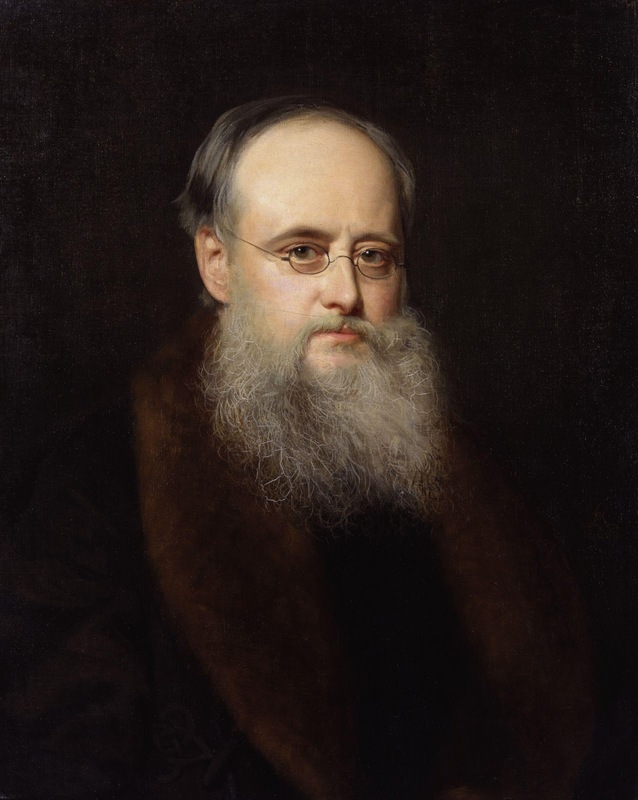 If there was one author I read more than any other this year, it would have to be Wilkie Collins. I've been reading his novels for years & I've read his most famous books, The Moonstone & The Woman In White. This year I read Man & Wife, one of his lesser-known novels, a collection of his novellas, Rambles Beyond Railways, about his travels in Cornwall & some of his short stories. The surprise classic read of the year for me was The String of Pearls by Thomas Prest. This rollicking melodrama is the basis for the opera Sweeney Todd. I loved it. It was a real surprise as I knew very little about the book before reading it. I expected it to be a bit of a clunky potboiler but, although there were more than a few plot holes, I was swept away by the enthusiam of the telling. 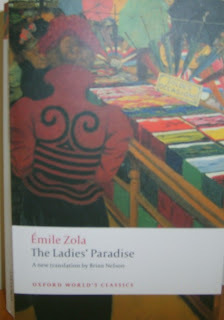 I've been reading Emile Zola's novels over the past few years. 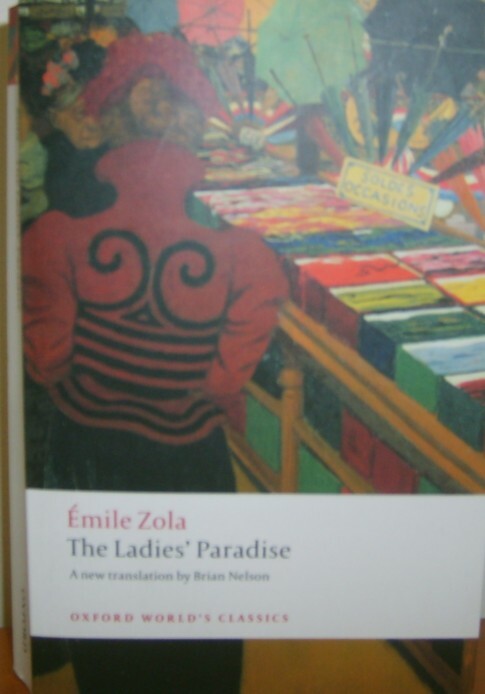 This year, I read The Ladies' Paradise, the story of the first department store in Paris & a homage to shopping. 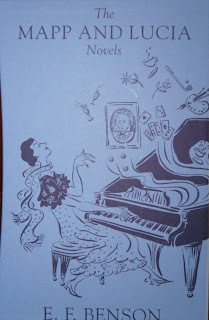 Gorgeous, lush descriptions of fabrics & dresses & a collection of wonderful characters. My favourite mysteries need a post all of their own so I'll be back with more good reads tomorrow. Some years ago I read Pat Jalland’s book, Death in the Victorian Family, a fascinating look at the rituals of death & mourning in 19th century Britain. 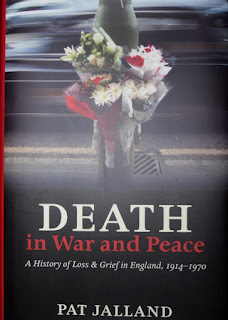 Pat Jalland’s new book is a sequel of sorts to the earlier book, taking her exploration of the English response to death from 1914-1970. The experiences of both soldiers & their families in WWI was the beginning of a change in the response of mourners to death. In the Victorian period, the majority of people died at home, cared for by their families & their local communities. There were rituals to be undergone as the body was laid out, friends & family viewed the body & then attended the funeral. A period of mourning was normal where the bereaved were distinguished by their black clothes & a withdrawal from social activity. Then, gradually, they would return to ordinary life. WWI completed the rejection of Victorian mourning rituals that had already begun. The scale of death was unprecedented. Men killed in action were buried on or near the battlefield so the family couldn’t attend the funeral. Often there was no body to bury as men were blown to pieces by bombs or lost in No Man’s Land as the battle moved on. Then, there were the thousands of missing, whose fate was uncertain. Many parents, siblings & wives found it almost impossible to believe their man was dead when they hadn’t seen his body & they had no definite proof of death. 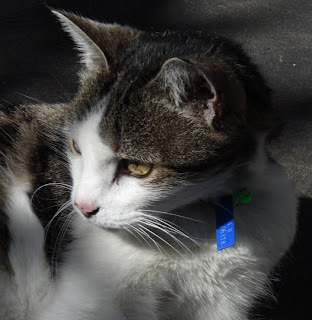 I am broken too, my old darling, to have lost our darling, to have lost him so young, before he had any chance- to think that all the years of our lives must be lived without him is crushing. I am overcome by it and cannot pretend I am not. Violet called on all her family connections to search for George. Amazingly she was able to go to France with the help of the American Ambassador & the Mayor of Villers Cotteret, the town near where George’s regiment was fighting. With the help of the Red Cross, local villagers & her connections, Violet eventually found the mass grave where her son & other members of his regiment were buried. She was able to have the bodies exhumed, identified & reburied. Violet was also able to bring comfort & certainty to the families of the other soldiers buried with George. There were nearly 90 bodies exhumed & over 70 were able to be identified. Violet wrote to all the families, telling them of the exhumation & sending photographs of the graves. Violet knew how much it meant to her to know where her son was & to have a physical focus for her grief & she was able to help the families of her son’s comrades in a practical way that helped her to mourn as well. The extracts of the letters to Violet from the soldiers who died with George are very moving. Most had received no more than a brief, formal notification from the War Office that their sons were buried at Villers Cotteret but Violet was able to give them all the details they craved. She had discovered as much as possible about the battle as well so the families had some sense of the circumstances of their loved one’s death. Violet’s quest can be compared to Rudyard Kipling’s search for his son, John, when he was reported missing later in the War. Kipling was a neighbour of Violet’s & as he had helped in the search for George, Violet did all she could for the Kiplings as they interviewed soldiers & tried to discover John’s fate. They finally had confirmation of his death but his body was never found. You will see then, dear ones, that it is quite impossible to get the body back...But I don’t worry about that so much and you mustn’t either, dearest ones...I never felt so strong in my faith that the dear lad isn’t dead but lives...His grave is all the world, and his memory is ours to cherish for all time, and he isn’t far from us. His investigations laid the foundations for the journeys the family made to his grave from 1919 to 1931. Although the family erected a memorial tablet in their local church, this wasn’t the same as having an actual gravesite to focus on as they mourned. Their first visit in 1919 was only possible because Julian had already been to the site & located the grave. The ground had changed so much as the opposing armies fought over the same areas & without his earlier visits, they would not have been able to find the grave. This was before the IWGC had laid out the cemeteries that have become such an iconic image of the war. The Bickersteths left detailed diaries of their visits to Morris’s grave & it’s obvious that these journeys helped his parents to grieve & move forward. The pilgrimages were more problematic for Morris’s brothers who were also veterans. The trips brought back painful memories of battles & the horrific sights they’d witnessed. Morris’s brother Burgon found it impossible to sleep on these trips & he used his grief as an incentive to write a history of his regiment & exorcise the memories. I’ve concentrated on these two stories from the early chapters of Death in War & Peace but there is so much more in this book. There are chapters on the mining disasters in northern England in the interwar period where dozens of men were killed in explosions or collapses in mines. Often the bodies could not be retrieved & whole communities were devastated by the loss of breadwinners. Traditional mourning rituals had survived in the north much longer than elsewhere & families were devastated by the death of a loved one with no body or if the body was recovered, the stigma of burial in a mass grave, the traditional way of burying paupers. There was also the financial trauma as mine owners rarely paid compensation to the families & women were left with children to support. Very sad tonight, darling, just can’t help missing you so desperately and keep thinking I may never see you again on earth, it’s ghastly...I can’t go on without you...You know darling, I think I was numbed at first by shock, because now the pain gets worse and worse every day. Peggy felt the pressure to keep going bravely without breaking down in public or showing her grief. She turned to praying for miracles in the hope that she would have news that he was alive but gradually she had to accept that George was dead. In September came news that the bodies of a crew member of her husband’s had been found along with five unidentifiable bodies. She realised that one of those men must be George. Her diary ends here & it seems to mark her acceptance of his death. After WWII the National Health Service led to more changes in the way people dealt with death. More deaths took place in hospitals &, with advances in medical treatment, people were living longer & dying of illnesses such as cancer & dementia. Many doctors saw every death as a failure on their part & so it became an embarrassment when a patient died. They were often shuffled off to a side ward. Families had no way to structure their mourning. Religious faith was declining, mourning clothes & seclusion were a thing of the past. The rise of cremations rather than burials also led to a sanitisation of death. The 1960s saw a gradual change in attitudes & it became more acceptable to seek counselling or talk more openly about grief. The hospice movement also helped to bring some dignity to the dying & gave the families a way of dealing with death. 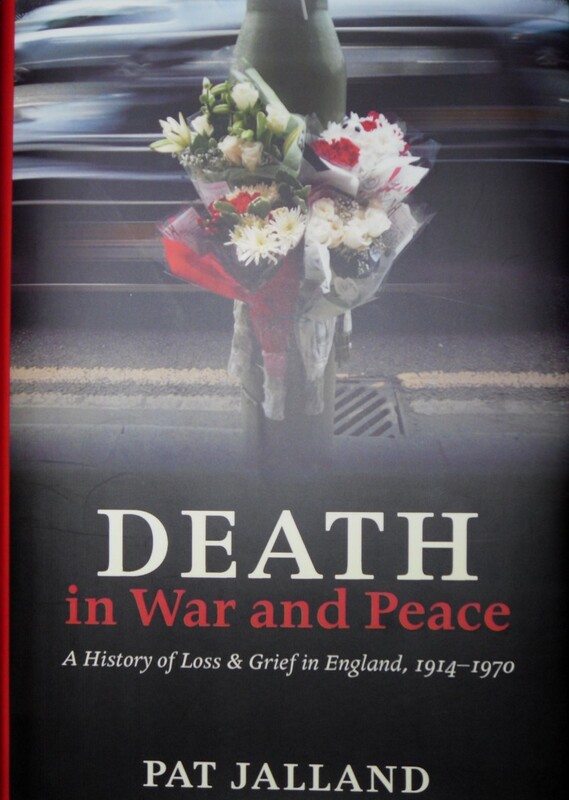 Death in War & Peace is a moving & involving look at the ways people have coped with grief over the last century. The many personal examples from letters, diaries & interviews are often very touching & create a very human context for the theoretical & statistical sections of the book. I found it fascinating. Abby & I would like to wish all visitors to I Prefer Reading a very Merry Christmas. As you can see from these photos, Abby has started relaxing already. 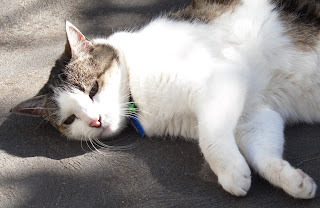 It's a beautiful summer day here in Melbourne, crisp this morning & a warm, sunny afternoon. I've been baking cheese & spinach bread to take to my sister's for Christmas lunch tomorrow. I've done a little housework, organized a few things for tomorrow & Abby has been keeping an eye on my progress. Best of all, I don't have to go anywhere near a shop of any description. 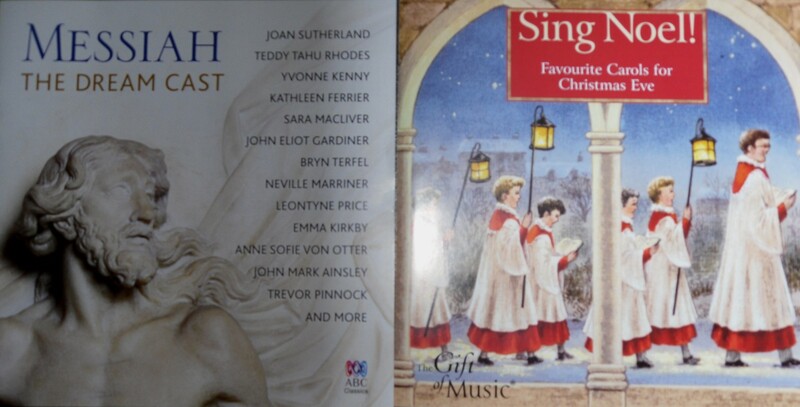 I'm listening to Annie Lennox & Bryn Terfel's new Christmas CDs which arrived in the mailbox today, at the last possible moment for festive listening & later today I'll be going to a family carol service with friends, a Christmas tradition now for over 10 years. Over the next week I'll be posting about my books of the year. I usually do a Top 10 but this year, I think I'll copy Cornflower's terrific idea of listing my top books in categories like mysteries, history, classics & biography. Merry Christmas everyone. I hope the weather in Europe & the US doesn't stop you being where you want to be this Christmas. 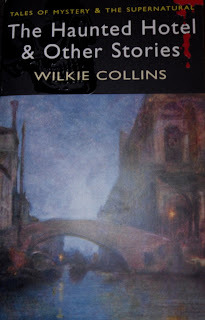 Rambles Beyond Railways is Wilkie Collins’s account of a walking tour through Cornwall in 1850. He just made it before the railways though because a note written for the second edition refuses to apologise for his title, now out of date. This is a very good humoured book. Wilkie & his artist companion, Henry Brandling, want to see everything of note in the county. They are objects of pity & amusement to the locals who can’t understand why gentlemen who can afford to travel by coach or horseback, choose to walk. Nevertheless, they are cheered by the kindness & hospitality of the people they meet on their travels. They visit all the well-known towns & villages, St Ives, Liskeard, the pilchard fisheries along the coast, Loo Pool & the Lizard Head. One of their most fascinating expeditions is their visit to Botallack Mine, a copper mine on the coast where most of the workings & shafts are hundreds of feet beneath the sea. The excursion begins amusingly with Wilkie being fitted out by a gigantic miner in the appropriate clothing for a trip down a hot, dirty mine. When the miner has obligingly hoisted Wilkie’s trousers up under his armpits & folded over his sleeves several times, he’s ready at last to descend into the mine. They descend ladders until they reach a depth of 420 feet but this isn’t the bottom of the mine. The shafts descend for hundreds more feet & spread out beneath the ocean for hundreds more. They decide that they’ve gone far enough, trying to imagine the miners working for 8 hour shifts in such hot, moist, dirty conditions, and thankfully ascend to the surface. They are amazed by famous natural phenomena like the Cheese Wring (photo above from http://ontheroad.buy.co.uk), a pile of stones that seems to defy gravity as it balances precariously with the smallest stones at the bottom of the pile & huge stones on top. I could sympathise with Wilkie as he gingerly stood under the overhanging stones fearing they might topple over & crush him at any minute. Kynance Cove is famous for the water spout known as the Devil’s Bellows & the Devil’s Throat emits an eerie groan as the water rushes into it. 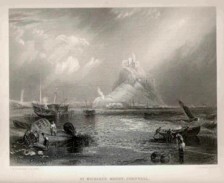 The history of St Michael’s Mount (photo below from j-m-w-turner.co.uk) is told through a series of “dissolving pictures” that take the reader from the earliest Stone Age people of the area through medieval times when the monastery was built to modern times. I read this book on my e-reader & I can see I’m going to have to take a lot more notes to review an e-book than a printed book where I can flick back & forth & leave post-it notes on pages I want to quote or remember. It’s been quite tedious trying to remember placenames & find details again. Still, I couldn’t have easily read this book without the e-reader. Finding pictures to illustrate the post will also be more challenging without the cover of the book to photograph. Still, as a first test of the e-reader, it was very successful. I think I’ve been converted! * Thank you to everyone who told me that the picture of St Michael's Mount in the original post was actually Mont St Michel in France! I've replaced it with the Cornish Mount by Turner. I love a good clerical mystery & I’ve found a new author to follow. 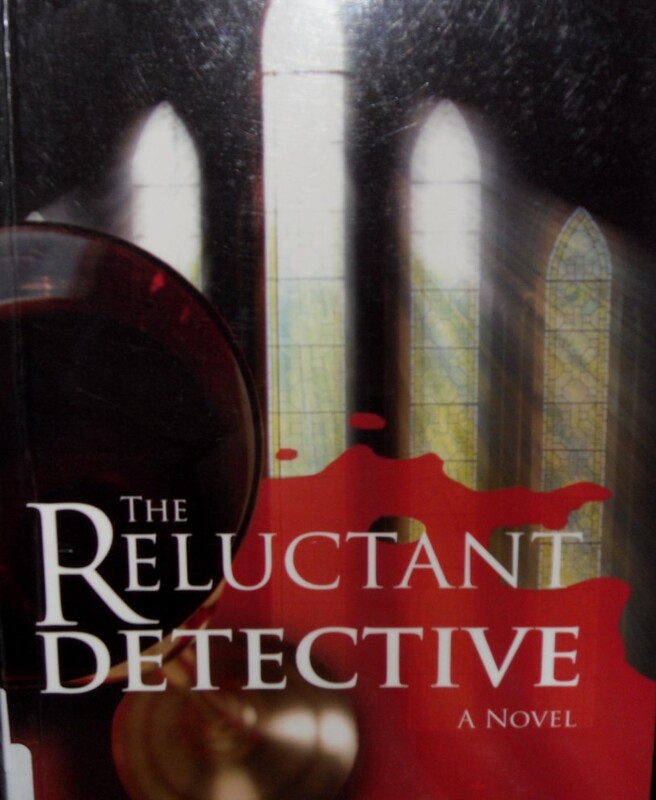 The Reluctant Detective is the first book in a new series by Martha Ockley, a new author to me. 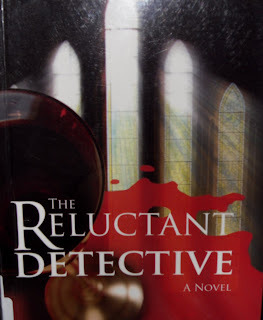 This book is in the tradition of my favourite clerical mystery authors, Kate Charles & D M Greenwood with a touch of Dorothy L Sayers & Agatha Christie. Faith Morgan is a woman in her 30s, recently ordained after a career in the police force that became unsatisfying once she felt a vocation for the Church. As well as a career, Faith also left behind a serious relationship with Detective Inspector Ben Shorter. Faith has been working in an inner-city parish but is interested in moving to a rural parish. Little Worthy is a quiet village near Winchester. Faith knows the village from childhood holidays & is feeling a little nostalgic as she arrives on a Sunday morning just before the service begins. Her hopes of remaining anonymous are immediately dashed by the beady eyes of churchwarden, Pat Montesque, who catches the glint of her cross on the collar of her dress & moves in to find out everything about Faith in ten minutes or less. The incumbent, Alistair Ingram, is about to retire because of ill-health & the parish of St James’s would be a new challenge for Faith. Faith’s nostalgic pleasure in the church is shattered when Alistair Ingram collapses & dies during Communion. Her police training takes over as she rushes to offer help but she soon realises that this may not be a simple death from a heart attack but something more sinister. Her instincts are correct. Ingram was poisoned. She’s disconcerted but not surprised when Ben Shorter arrives to head the investigation team. Their relationship foundered on his inability to understand her vocation & also his involvement in another case that went wrong. The details of this case are unclear but Ben obviously disappointed Faith in his handling of a vulnerable suspect & their relationship never recovered. Faith is asked to fill in as Vicar of St James’s until a new incumbent is appointed & she finds herself becoming more & more involved with the parish & her new parishioners. She can’t stop herself doing a little investigating. Could the answer lie in Ingram’s past life as a financial consultant? In his spiky relationship with his son, Don? In his relationship with a divorced parishioner? Or was the dispute with a neighbouring farmer over a piece of land enough to push the farmer, a troubled loner, over the edge? There are lots of motives & suspects to mull over, maybe too many, & I picked up enough clues to work out the murderer, but it didn’t matter. I loved this book. I read it in an afternoon. I loved the atmosphere of the rural parish, the characters of the other clergy, including a particularly unpleasant press officer & Faith’s mentor, Canon Jonathan, who makes a brief appearance. Faith herself is a character I’m looking forward to meeting again. She's still finding her way in her new life but she has a genuine desire to make a difference & be a spiritual guide to her parishioners. Her relationship with Ben is still smouldering & it will be interesting to see where Ockley takes them in the next book in the series. Martha Ockley is the pen name of Rebecca Jenkins who has a website here. She has written a series of Regency mysteries as well as non-fiction. It’s no wonder that the clerical atmosphere & politics are spot-on as she’s the daughter of the Rt Revd David Jenkins, former Bishop of Durham. I love Christmas baking. 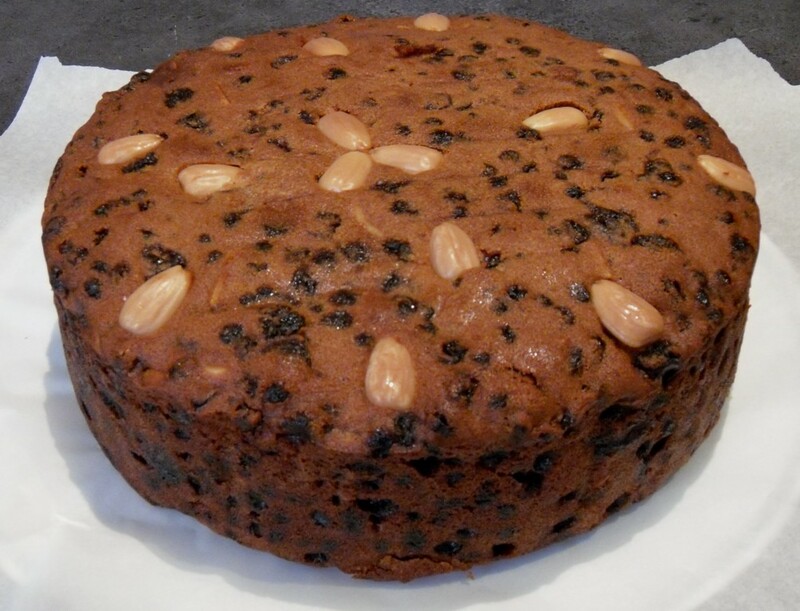 The pudding & cake were made weeks ago to the accompaniment of Christmas carols & Handel's Messiah. Today, I got the cake out of its wrapping to take in to work for morning tea. I don't do marzipan, just the traditional almonds dotted on the top. This year I baked the cake in my new oven so I'll be interested to see how it turned out. Of course, I've been feeding it with brandy for the last 6 weeks so any deficiencies in texture or crumbliness will be well-hidden. I've also made chocolate truffles as presents for some of my friends at work. I discovered these little foil cases in a kitchen shop & they look much better than the paper cases I usually use. 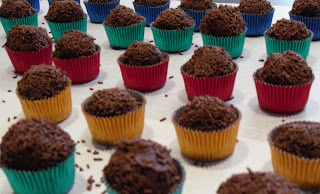 They're smaller than the paper cases though & you can see it took me a while to get my eye in when rolling the truffles. Still, they won't mistake them for shop-bought ones! I own half an e-reader! 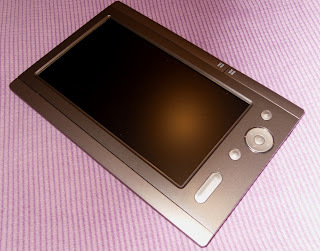 I've been coming around to the idea of an e-reader for a while now. Ever since I realised that lots of the out of print 19th century books I want to read were available as e-books. A lot of them are free as well. My friend P loves new technology but he doesn't read much. He saw this nifty little e-reader for $99 & we decided to buy it. I'll probably end up buying his half once he's finished playing with it & exploring the photo & film options. My experience so far has been positive. I don't like musty secondhand books so my only options for authors like E M Delafield have been taking a chance on secondhand books from the UK (not much Delafield in secondhand bookshops in Australia) or expensive, unattractive POD editions. I was thrilled to discover the Girlebooks website where I downloaded Delafield's War Workers for free. They have a great range of 18th & 19th century books by women writers available for free. I also downloaded Elizabeth Von Arnim's The Adventures of Elizabeth in Rugen & Anna Katherine Green's The Leavenworth Case. Then, it was over to the Book Depository where they have thousands of Dodo Press POD books available as free e-books. I now have Wilkie Collins's Rambles Beyond Railways (I'm reading this at the moment), Clement Shorter's Charlotte Bronte & her Circle, Horace Walpole's Historic Doubts (about Richard III), Mamie Dickens's My Father As I Knew Him & Rhoda Broughton's Twilight Stories. These were all PDF files. The reader can also accept EPub files. P says they're easier on the eye & easier to adjust the font to fit the page but I had some trouble with the drag & drop part of the download so I'll need some help with that. I think I'll enjoy using the e-reader to read those books I can't easily get any other way. If there's a Penguin or OUP edition in print, I think I'd rather have that, even if I have to pay for it. I love the Notes & Introductions that are part of the package with the classics in print. I’ve been reading about Christmas this week. 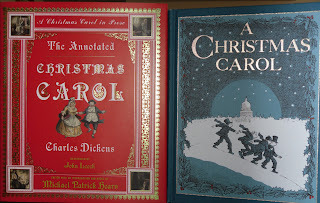 Both the historic origins of Christmas & fiction published at Christmas time, usually with a Christmas theme. Over the past few years, Hesperus Press has reprinted several of the Christmas special editions of Charles Dickens’s Household Words magazine. These special editions, although “conducted” by Dickens, have contributions of stories or poems by other authors. 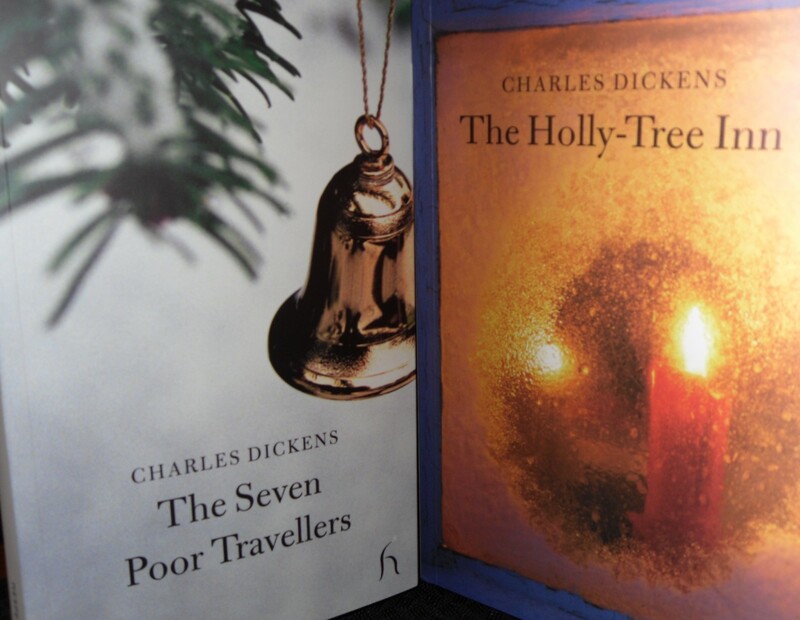 The Seven Poor Travellers & The Holly-Tree Inn were first published in the 1850s & brought together by a theme, a surrounding story written by Dickens. In The Seven Poor Travellers, the framing story is of a traveller who visits an almshouse at Christmas time & provides a lavish Christmas dinner for the seven poor travellers who are entitled to a meal & a night’s accommodation. In return, he asks each of the travellers to tell him a story. In The Holly-Tree Inn, a young man planning to emigrate after an unhappy love affair is snowed in at an inn & after reading everything he can find, relieves his loneliness by asking the staff at the inn to tell him a story. The quality is variable. 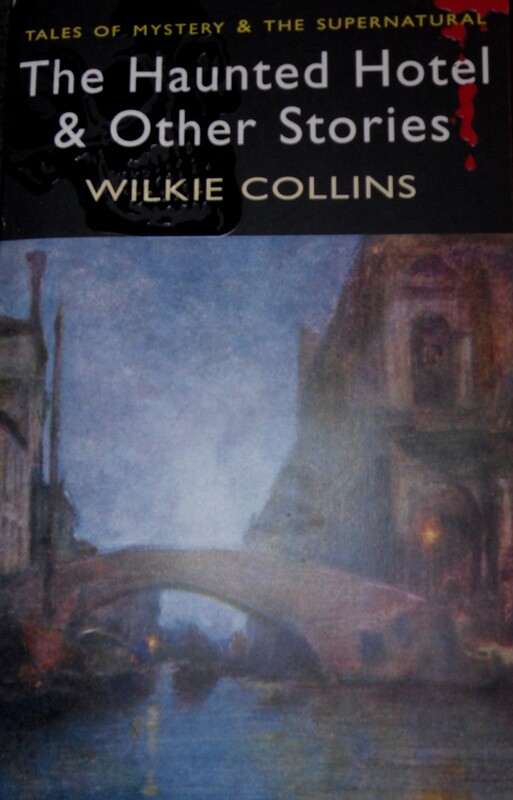 Wilkie Collins’s contributions in both volumes are the best. I may be biased because Wilkie is one of my favourite authors & I’ve read a lot of his work this year but I enjoyed his stories very much. In The Holly-Tree Inn he tells The Ostler’s Story. This was subsequently reprinted as The Dream Woman & is a frightening tale of a man who dreams of his own murder by a woman who he subsequently marries. In The Seven Poor Travellers, Collins is the Fourth Poor Traveller & tells an exciting story about a wedding almost derailed by blackmail & a clever lawyer who foils the plot. I’d read both these stories in other anthologies but I enjoyed reading them again. Dickens’s own contributions consist mainly of the framing stories but he also wrote The Boots’s Story in The Holly-Tree Inn & I’m afraid this is a dreadfully twee & sentimental story of two children who decide to elope. There are also stories very much of their time that read very uncomfortably today. George Sala’s story in The Seven Poor Travellers is a disturbing story full of anti-Semitic stereotypes. Adelaide Anne Proctor’s poetry is conventional narrative verse with moral pointed out at the end. Bob had got a station out at the Dundenong-Hills, and told wonderful stories of riding after kangaroos, and wild bulls, and shooting splendid lyre-birds ... And really my brother’s villa on the Yarra River is a very fine place. It stands on a high bank above the valley, in which the Yarra winds, taking a sweep there, its course marked by a dense body of acacia trees. In the spring these trees are of resplendent gold, loading the air with their perfume. Now they were thick and dark in their foliage, casting their shade on the river deep between its banks. I can see the Dundenong-Hills from my house but now they’re called the Dandenong Ranges. I shuddered at the thought of shooting lyrebirds but I could smell the acacia blossom that we call the wattle. Not sure about villas on the banks of the Yarra but there are still plenty of 19th century mansions there. Howitt also wrote Land, Labour and Gold, about his time in Victoria, a book in every library’s Local History collection. It was lovely to come across this story. Both these books are lovely seasonal gems to dip into or read straight through. I think it’s a clever idea of Hesperus to reprint them. I’ve also been listening to Miriam Margolyes read A Christmas Carol every day on the way to work. My favourite Christmas story. I read it every year & know passages of it by heart. My favourite part is the beginning. Marley’s Ghost. I can see & hear the ghost trailing its chains and cashboxes as it comes up the stairs to Scrooge’s fireside. The description of the ghost with the pigtail & the grave cloth around its head telling Scrooge, “I have sat invisible beside you many and many a day.” sends a shiver through me every time. 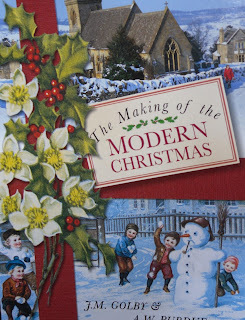 I’ve also read The Making of the Modern Christmas by J M Golby & A W Purdue. This beautifully illustrated book is about the history of Christmas from the earliest times to the present. The authors discuss the pagan origins of the Christmas tree, the holly & the mistletoe & how the old festivals of Misrule & Yule were changed into Christmas. How the Christian Church gradually took over pagan festivals as its influence grew & how some of the traditions we associate with Christmas are of much more recent origin than we think. Most of the customs we think of as traditional were started in the 18th or 19th centuries. They were popularised by Dickens’s A Christmas Carol & the Christmas chapters of The Pickwick Papers & Washington Irving’s story, Old Christmas. There are chapters on the differences between the American & English Christmas & how Christmas was celebrated during the World Wars. A really interesting look at the historical origins of Christmas. After all this 19th century tradition, tomorrow I plan to reveal the technological leap I've taken into the 21st century. Stay tuned for further details! 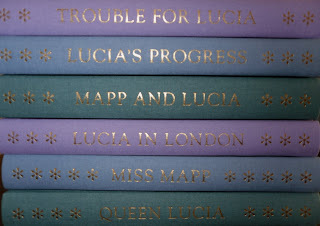 The year of Mapp & Lucia? 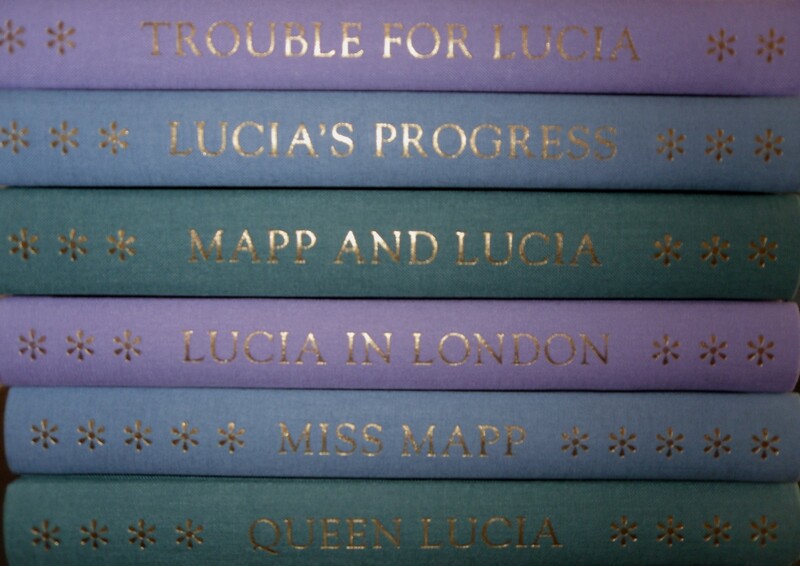 I mentioned a few weeks ago that I had succumbed to the temptation of rejoining the Folio Society for another year because one of the offers was the boxed set of Mapp & Lucia novels by E F Benson for just $9.95. Of course, I have to order 4 other books at the normal prices but that's really no hardship. I chose Hons & Rebels by Jessica Mitford, The Country Child by Alison Uttley (I've read both of these but couldn't resist these editions as I didn't own copies already), a volume of short stories by Daphne Du Maurier & The Sun King by Nancy Mitford. Folio books are lovely & I do enjoy owning & reading them. I have quite a few Folios that are duplicates of books I already own as they are such beautiful objects. I promised a few pictures & here they are. Above is the box the books live in. Then we have the books themselves. Gorgeous cloth covers in mauve, pale blue & green. I tried to take photos of the drawings on the front covers but they didn't come out very well. 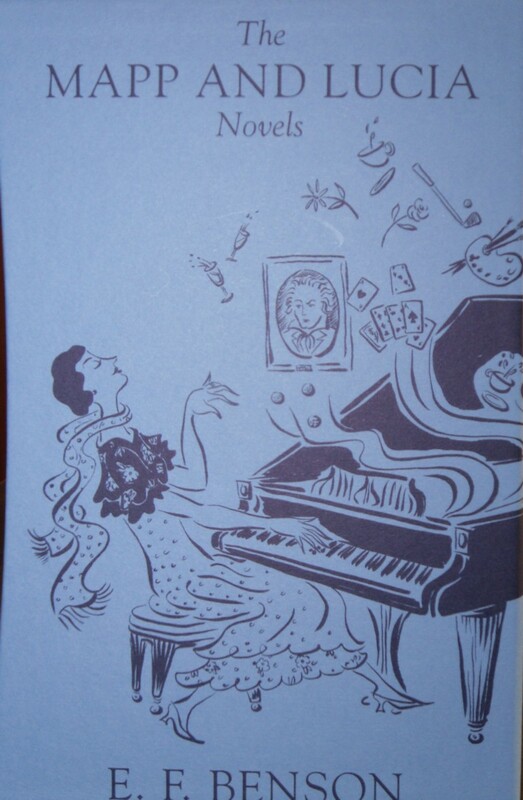 Here though is just one of the many lovely line drawings by Natacha Ledwidge. I'm starting to make reading plans for next year & I do think 2011 may be the year I fall in love with E F Benson. Well, I've paid $9.95 for the books, I can't let that money go to waste, can I? Has anyone else started planning for next year's reading? Holly Brown doesn’t celebrate Christmas. It’s never been a happy time of year. Her mother died at Christmas giving birth to her. She was brought up by Strange Baptist grandparents who were kind & loving but didn’t do the secular side of Christmas. 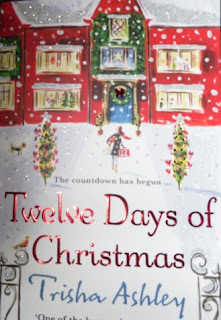 Holly married Alan & discovered the joy of Christmas trees, paper chains & silly games. Then, eight years ago, Alan died just before Christmas. He fell through the ice trying to rescue a dog. Holly has given up on Christmas. She restructured her life to avoid it. She caters for posh house parties most of the year but during winter, is a house sitter, choosing the most remote locations possible. This year, the job she had lined up in the Scottish Highlands falls through & she takes on a last minute emergency post in Lancashire. Jude Martland is in the US, avoiding Christmas at his family home, Old Place, after his brother ran off with his fiancée last year. Holly takes over from Jude’s regular house sitters at the last moment to look after the house, Merlin a gorgeous old lurcher, Lady, an ancient horse & Billy the goat. Holly doesn’t bargain on the rest of the family & the weather conspiring to revive her Christmas spirit. Holly & Jude get off to a bad start with grumpy trans-Atlantic phone calls that cut out with the bad reception. Their spiky, bad-tempered conversations are a delight. This is a romantic comedy so we know where the relationship is headed but it’s a lot of fun seeing how these two people who have been hurt in love, get over their mutual antipathy & become friends. The rest of the Martland family are delightful. Noel & Tilda living in the Lodge, with their granddaughter Jess staying for the holidays. Becca, the horsey, kind-hearted aunt who helps Holly with the horses. Old retainers, Nan & Richard living in almshouses in the village. Somehow, Holly is convinced to provide the traditional family Christmas house party for the family, including Guy & Coco, the model & aspiring actress he stole away from Jude the year before. Guy turns up to freeload when he hears Jude is away but Jude’s sudden return to stop Holly taking advantage of his aging relatives changes everything. Holly has also been reading her late grandmother’s diaries about her work as a nurse during WWII & it turns out there’s an intriguing connection to the Martland family. Holly & Jude continue sparring with misunderstanding piled on misunderstanding until Holly is the only one who can’t see that she & Jude are made for each other. This is a gorgeous book. The setting, in frozen Lancashire with the house cut off by snow; the wonderful characters- gentle Noel, bossy Tilda, charming, untrustworthy Guy & selfish Coco; the humour and the food. I haven’t mentioned the food yet. This is one of the things I love about Trisha Ashley’s books. She is obsessed with food. Holly is a fantastic cook & we’re treated to descriptions of roast dinners, stuffed pike, egg & bacon muffins, Christmas cake, chocolate cake in a mug, & a Christmas dinner with all the trimmings. This would be the perfect book to read on a winter’s afternoon with a pot of tea & some chocolate at the halfway mark. But, I couldn’t manage that in Melbourne. Luckily it’s been a cool weekend for summer & I could still have the tea & chocolate while I wallowed in this lovely romantic story. At lunch no Ernest. I waited till half past one, worried myself into a fit of acute indigestion, kept looking out the window for an ambulance: actually (how mad it seems!) went to the outside lavatory to see if he had hanged himself. Then remembered that he had said he was going to Brighton. I don’t know about you but that last sentence just took my breath away. I quickly got hold of a second-hand copy & I’ve been absorbed in Alice Dudeney’s Diary all week. Alice wrote under her married name, Mrs Henry Dudeney. She was a very famous novelist in her day but I’d never heard of her. She was a friend of Sir Philip Sassoon & was often invited to his country house weekends. She was compared to Thomas Hardy & thought superior to Edith Wharton. The list of her novels in the front of the book runs to over 40 titles written from 1894 to 1937. The editor of the Diary, Diana Crook, says that Alice would be astounded to know that her work is completely forgotten. Titles like Married When Suited, What a Woman Wants, The Maternity of Hariott Wicken & Puff Paste, sound intriguing, I wonder if she’ll ever be rediscovered? The Diary begins in 1916. Alice’s marriage to Henry (Ernest) Dudeney has been a stormy one. Ernest was also a writer & was famous for his books of mathematical puzzles. He also wrote for some of the many magazines of the time, including The Strand. Alice was 18 when they married in 1884. In around 1913, Alice had taken their daughter, Margery, left Ernest & moved to Sussex. She was having an affair with a married man, David (the editor has not revealed his full name to avoid embarrassing his descendents). 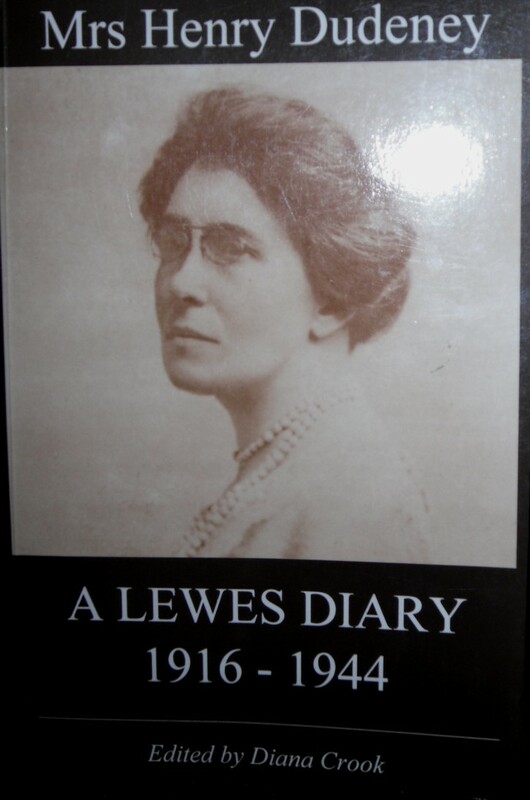 However, by 1916, Margery has gone to Canada to be married & Alice has reconciled with Ernest & they are living in Lewes. There are no diaries for 1914 & 1915 so the exact circumstances of their reconciliation are unknown. From later entries, it’s obvious that, although David loved Alice, he wasn’t prepared to leave his wife for her. After Margery left, Alice may have been lonely & it is known that she wrote to Ernest asking him to live with her in Lewes. Their marriage is one of the fascinations of the Diary. The relationship swings from vicious arguments & cold rages to considerable affection. Money seems to be one of the triggers for discord. Ernest seems upset by any expenditure at all & it’s not clear how much each contributes to the household. Alice buys up several historic properties in Lewes over the course of the Diary & she always speaks of her money, her lawyer, her agent. 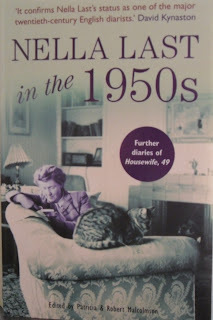 Until her novels fell from favour in the late 30s, she seems to have made a comfortable living from her career. Ernest’s failing health shocks Alice into feeling more tenderness for him than she had felt for years. 8 April 1930How am I going to remember all the sharp details of this time. How every morning I put a fresh little jug of flowering currant in his room, because he loves flowering currant. And how, this very day, I have folded up and put his suit away, for he no longer gets up. And locked away his ring, which for months he’s kept in his waistcoat pocket, because his finger got so thin. Really, visitors are a nuisance. Winnie (maid) comes in to my room and announces that Ida can’t get up: so ‘giddy’. Elderly women should stay in their own homes. I do. Told Ida she’d better stop in bed all day. Said she would – might she have another pillow? Yes, she might. And got it. Might she have some brandy? Hadn’t got it, but went out and bought a half-bottle – 8/9d! Which I really grudged, but I suppose it ought to be in the house. Gave her some and she felt better. Chicken, not much, and ice cream for her dinner: complained that the ice cream melted too soon! I must admit that I almost gave up on this book before I’d really begun. I thought it was an impulse buy that had gone wrong. The early entries are very bitter. It’s the middle of WWI, she’s trying to re-establish her relationship with Ernest, she’s having problems finding reliable servants, she’s still in love with David & she’s missing Margery. Once she has bought & moved into the Castle Precincts House, a beautiful historic house in Lewes, Alice’s excitement in making her home seemed to overcome some of her unhappiness & I suddenly couldn’t put the book down. Alice Dudeney left her diaries to the Sussex Archaeological Society with the proviso that they not be opened for 25 years. However, it was thought that, even then, the Diaries still had the capacity to hurt people living in Lewes so the Society closed them again until 2000. This ban was relaxed when a writer researching Ernest’s life applied to read them & so the editor was able to put together this volume which was first published in 1998. One of my more successful impulse buys. Martin Edwards was discussing the pros & cons of reading a mystery series from the first book through to the end on his blog recently. Does it really matter if we jump in at Book 5 or 15? Some series, the classic puzzle type of mystery for instance, had very little character development so it didn’t matter where you started, the detective was very much the same. Modern detective series involve a much greater investment from the reader & we expect more than a cardboard cutout for a detective. I know I become fond of my favourite detectives, their colleagues & families. I want an update on Reg & Dora Wexford & their daughters or Kinsey Millhone & her neighbours. I’m on tenterhooks about the relationship between Daniel Kind & Hannah Scarlett in Martin Edwards’s Lake District series & I’m always happy to catch up with Wes Peterson & his boss Gerry Heffernan in Kate Ellis’s books. If the author is doing their job properly a new reader will soon find out all they need to know about a protagonist without regular readers becoming bored with the repetition of basic facts. Of course, it can be a little disconcerting to read the last book in a series first where there’s a dramatic climax to the stories of several major characters & then go back to the beginning & pick up Book 1. Well, that’s what I’ve done with Ann Cleeves’s Shetland Quartet. I read the last book, Blue Lightning, first. I loved it so I went back to the beginning & read Raven Black. I’ve just finished White Nights & I have Red Bones on the tbr pile. Knowing the end of the story hasn’t spoiled the enjoyment of the earlier books. This is a wonderful series. Ann Cleeves deserves all the awards & praise she has won. The plots are great but, for me, it’s the setting & Detective Jimmy Perez that are so beguiling. Shetland is a major character in these books. The weather, the landscape, the way of life of people who have lived there all their lives & the visitors & incomers who have just arrived. In White Nights, it’s summer. The sun never quite sets & in the white nights, people go a little crazy. Jimmy Perez attends the opening of an exhibition at a gallery, the herring House, in Biddista, a small village. Bella Sinclair, local identity & famous artist is exhibiting along with Fran Hunter. Fran & Jimmy’s relationship has moved from detective & witness in the first book to friendship & now, they’re ready to take the next step. Fran is English, divorced & living in Ravenswick with her daughter, Cassie. At the gallery, a stranger walks in, looks at some of the pictures, then collapses sobbing on the floor. Jimmy tries to find out who he is but he has no ID & he vanishes. Next morning, the stranger is found hanging in a nearby shed. It looks like suicide, but the doctor confirms that it’s murder. Jimmy’s investigations are helped & hindered by the fact that he’s a local. He grew up on Fair Isle so he knows these people. 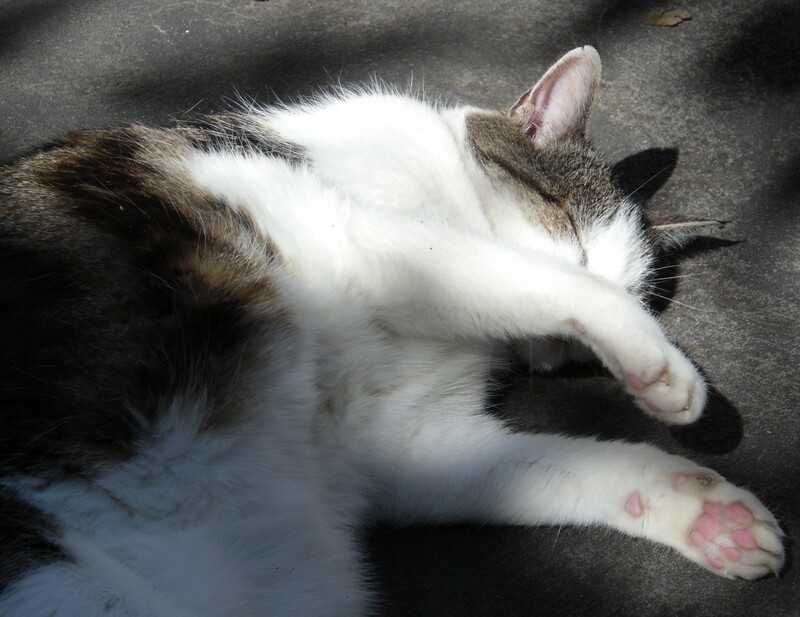 The few families living in the area close ranks & Jimmy finds it hard going. His frustrations include having to work with a team from Inverness, led by Roy Taylor, an abrasive Liverpudlian who left his family’s expectations behind to join the police force & move as far away from home as possible. Taylor & Perez have worked together before & have a wary friendship. Taylor is frustrated by Jimmy’s slow, careful way of investigating but has to admit that he would get nowhere on his own. When a second murder is committed, Perez realises that the solution lies in the past. I think anyone who enjoys a classic murder mystery would love this series. I was probably the last mystery reader in the world to catch up with Ann Cleeves but now I’m sorry I only have one more Shetland novel to read. Christmas is one of those times of year when I find myself reading, watching & listening to old favourites. 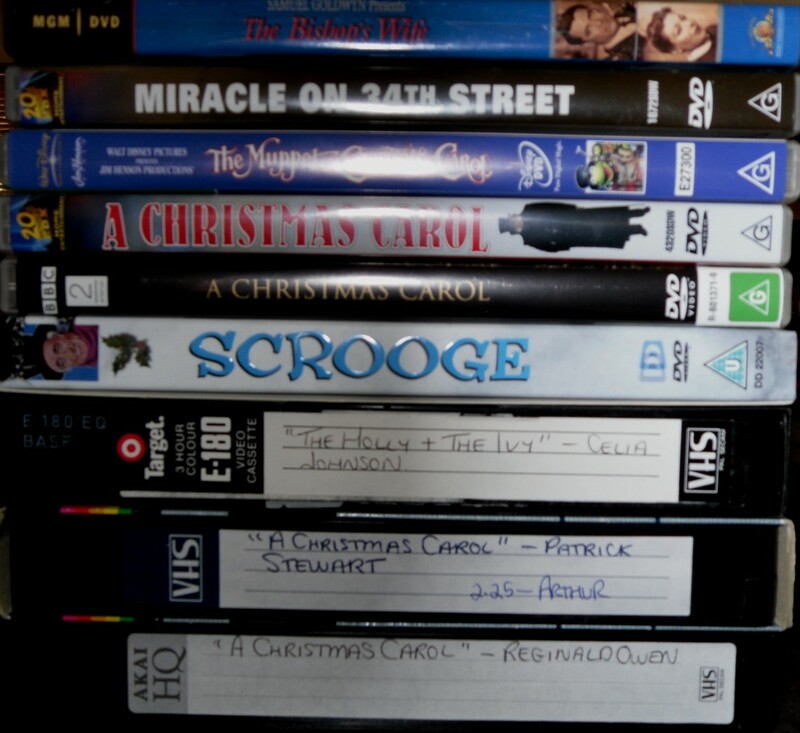 I've collected a lot of Christmas books, CDs & movies over the years & they nearly all make an appearance over the next few weeks as Christmas approaches. I've been a member of the Folio Society for many years & they often produce a Christmas anthology. 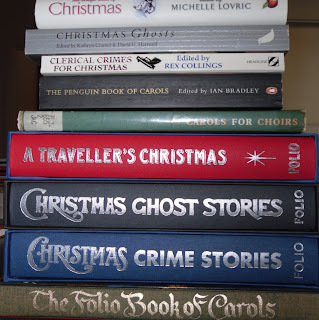 Ghosts & murder seem especially appropriate to Christmas, well, many authors have thought so! 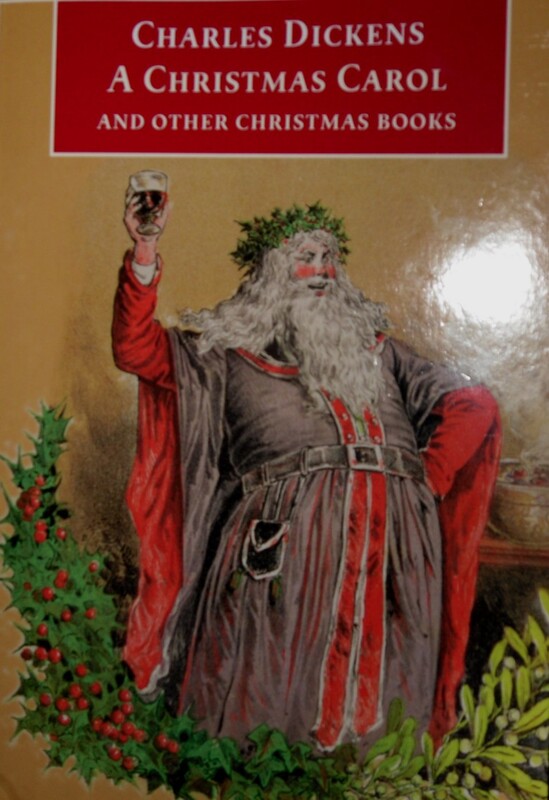 As well as the Folio books, I also have an anthology of Clerical Crimes for Christmas that has stories by classic authors like Agatha Christie, Edmund Crispin & Cyril Hare. The Virago Book of Christmas is also a lovely anthology to dip into. 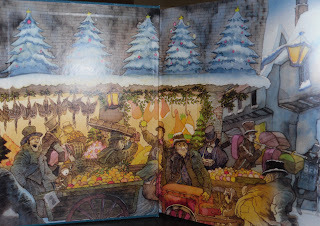 It has a short story by Stella Gibbons, Christmas at Cold Comfort Farm, that takes place before Flora Poste arrives. It's impossible to think of Christmas without Charles Dickens & A Christmas Carol. It probably doesn't surprise you to learn that I have several copies of this classic Christmas story. On the left, the beautiful annotated edition by Michael Patrick Hearn. Instead of reading the story in a couple of hours, I can take days to read it along with all the fascinating notes in this edition. On the right is the Folio Society edition. Here are the gorgeous front endpapers. I also have Penguin & Oxford Classics editions & audio books read by Geoffrey Palmer & Miriam Margolyes. I love the Hesperus Press editions of the special Christmas editions of Dickens's journal, Household Words. I have the latest, The Seven Poor Travellers, to read this year. 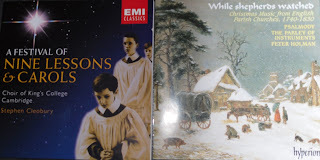 Traditional Christmas carols are among my favourite pieces of music. 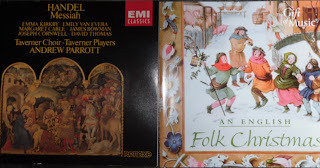 Here's the cover of the Folio Book of Carols, a collection of carols from medieval times to the present. The cover of the book is the same as the cover of the book the carol singers above are using. 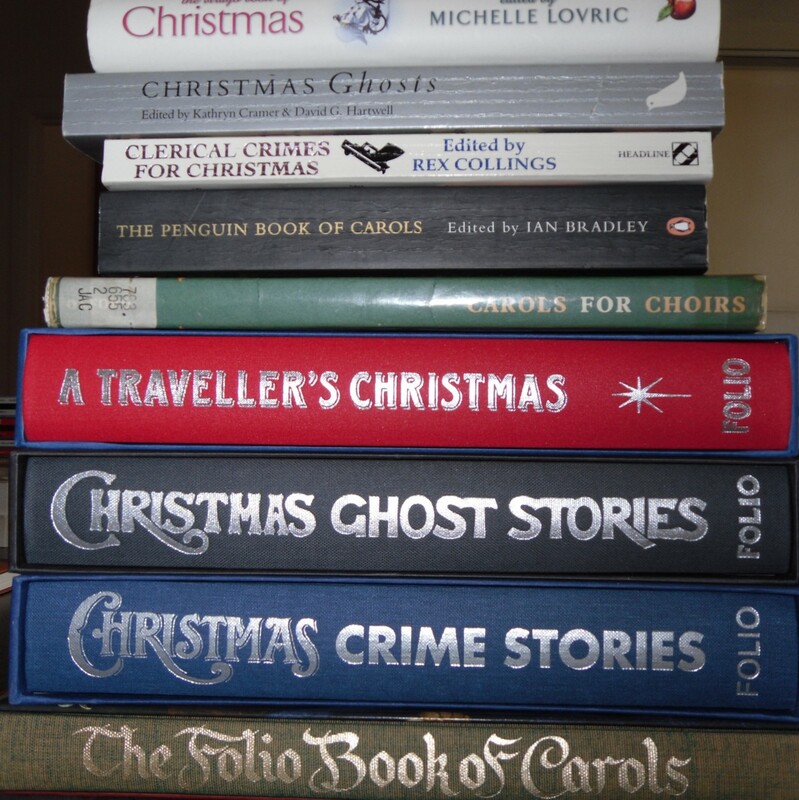 I'm just as fascinated by the origin of the words & music of the carols & I have a couple of books about this too. 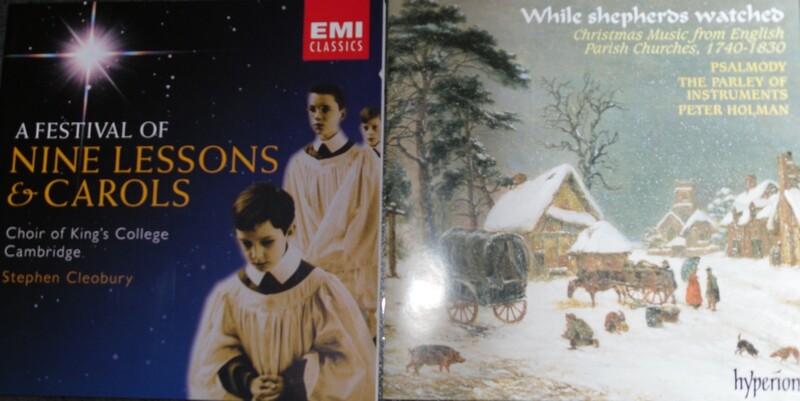 Every year I find myself buying more CDs of Christmas music. Handel's Messiah, traditional carols sung by choirs, soloists & folk singers.This year I've ordered Annie Lennox's Christmas CD & Bryn Terfel, one of my favourite singers, has finally released a Christmas album. I can't wait for them to arrive although I have plenty to be going on with. 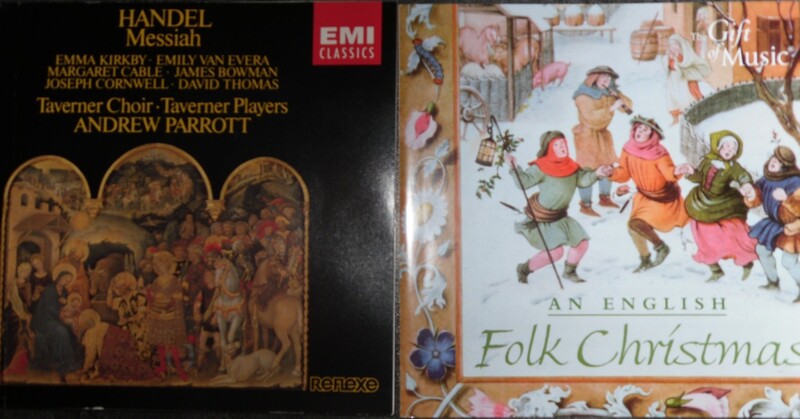 I've started listening to them already as I made my Christmas cake & pudding. Christmas movies are dominated by many versions of A Christmas Carol, including the Muppets version which I'm very fond of. Alistair Sim is my favourite Scrooge. Everything about that production is right. The black & white cinematography, the music, the way so many of the scenes are closely based on John Leech's original illustrations. Kathleen Harrison's performance as Mrs Dilber is a scene stealer. A less well-known movie is The Holly & The Ivy starring Celia Johnson & Ralph Richardson. Christmas in the 1950s in a cold Norfolk parsonage where family secrets are revealed. Wonderful cast including Hugh Williams, an actor I like very much. His son is Simon Williams who was so good as James Bellamy in Upstairs Downstairs. The resemblance btween them is especially strong in this movie. 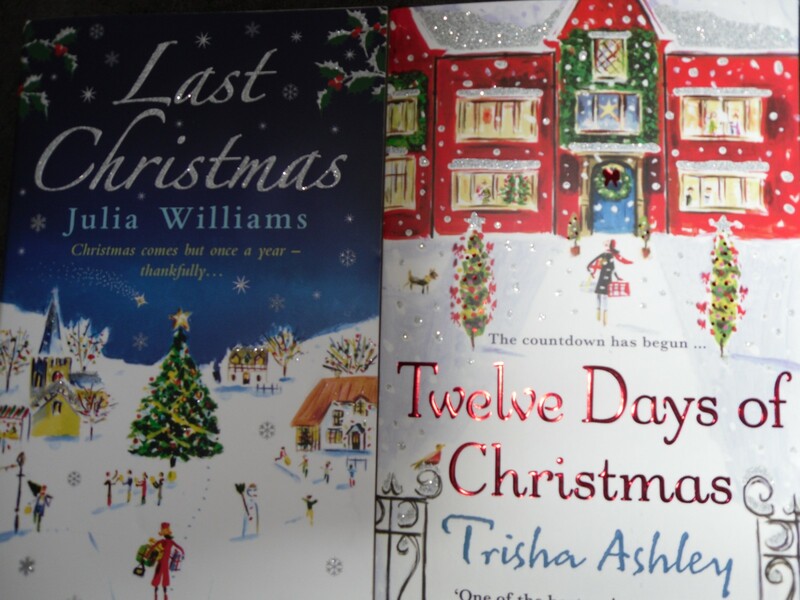 To end the Christmas roundup, I always enjoy a wintry romance at Christmas & this year I've bought Twelve Days of Christmas by Trisha Ashley & Last Christmas by Julia Williams. Look at those gorgeous covers. Snow, Christmas trees & glitter. What more could I ask for in the middle of a Melbourne summer? What are your favourite Christmas books, music & movies? I don’t read modern true crime or read the many forensic mysteries published these days or watch any of the CSI TV shows. But, I do love historical true crime. A nice domestic poisoning or unexplained death is just my cup of tea. Preferably Victorian or Edwardian. Jane Robins’s new book about forensic pathologist Bernard Spilsbury & the Brides in the Bath murders ticks all those boxes with a little social history thrown in. Spilsbury was the first Home Office scientist who became a star witness for the prosecution in many murder cases during the first half of the 20th century. He was a meticulous man who performed thousands of autopsies, writing his conclusions on index cards & building up an unrivalled knowledge of death in all its forms. One of the first cases he gave evidence in was that of Dr Crippen, accused of murdering his wife, dismembering her body & burying her in the cellar. Famously Crippen tried to escape to America with his mistress, Ethel le Neve, & was the first criminal caught using the new technology of the telegraph. Spilsbury examined the remains found in Dr Crippen’s cellar & decided that there was no doubt that they were the remains of Cora Crippen. Although he wasn’t the senior pathologist on the case, his confidence on the witness stand impressed police & lawyers & his career as an expert witness had begun. The Brides in the Bath trial of 1915 was one of the most sensational cases of the early 20th century. George Joseph Smith was accused of marrying three women, taking out life insurance on them, coercing them into making a will in his favour & then murdering them in their bath. However, there were no witnesses, the deaths were initially thought to be natural & there were no marks or signs of a struggle on the bodies. Smith used aliases & chose women who were living independently of their families or who had little contact with their families. Bessie Mundy, Alice Burnham & Margaret Lofty were all in their 30s & would have been resigned to being unmarried. This was a period when marriage was considered essential for a woman. An unmarried woman had no status, and, unless she went out to work, was dependent on her family. There were few careers open to women at the time and the problem of the “surplus women” had been discussed since the mid 19th century. Bessie, Alice & Margaret all married Smith after a short courtship. The pattern of the relationships was very similar. Smith would encourage his fiancée to run away & marry him secretly without letting her family know or he would meet the family &, if they seemed suspicious of his motives as Alice Burnham’s family were, arrange for a secret wedding & move far away from any possible interference. Smith would take out life insurance on his wife & they would make a will in his favour. Then, on their honeymoon or shortly after, they would take lodgings. The new bride would complain of headaches or some minor illness which resulted in Smith consulting a local doctor. Shortly after, he would go out to buy something for dinner & when he returned, he would find his wife dead in her bath. He would send the landlady or a servant for the doctor or police & the death was attributed to the slight illness the wife was said to have, combined with the effects of a hot bath resulting in heart failure or fainting & subsequent drowning. Smith would telegraph his wife’s family giving brief details but they usually arrived too late for the inquest or the funeral, which was as cheap & nasty as possible. Then, after promising to keep in touch with his in-laws, Smith disappeared, with his wife’s few belongings & owing rent. He would collect the insurance & move on. Alice Burnham’s family had been suspicious of Smith from the beginning but they could prove nothing. However, Mr Burnham saw a newspaper article about Margaret Lofty’s death & thought that the description of the bereaved husband could fit the man he knew as John Lloyd. The circumstances of Margaret’s death were identical to Alice’s. He went to the police & the case was taken up by Detective Inspector Arthur Neil in London. Neil’s meticulous investigation finally revealed that Lloyd & Smith were the same man. As the case gained publicity, other women came forward, claiming that Smith, under a variety of names, had wooed them & robbed them of their savings. Neil found out about Bessie Mundy’s death & eventually the three women’s bodies were exhumed & Bernard Spilsbury performed post mortems to try to ascertain the cause of death. The scene was set for a sensational trial where the scientific evidence was of great importance. That the three deaths were natural & it was all an unfortunate coincidence, strained credulity. But, with no marks noticed on the bodies at the time & the fact that they were now in a very poor state of preservation, could Spilsbury discover the cause of death? 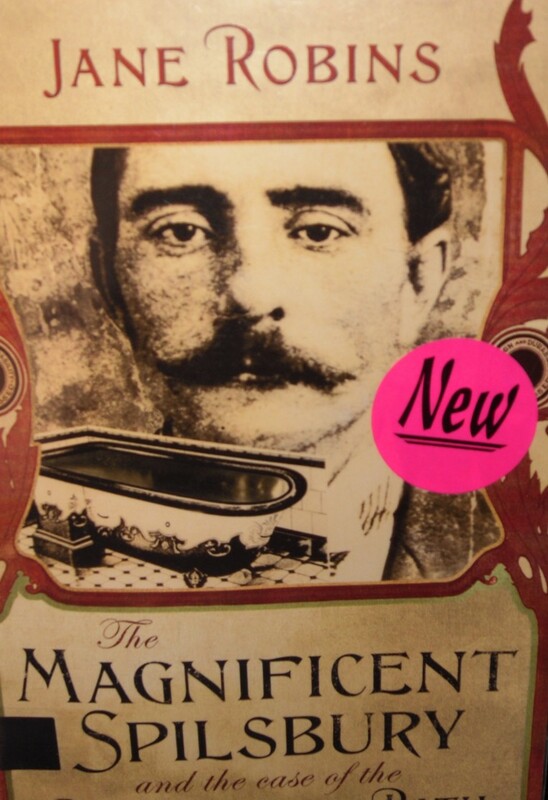 The Magnificent Spilsbury is as exciting as any detective novel. The trial caused a sensation. Women were fascinated by Smith & travelled long distances to attend the trial. There were more revelations about his private life that raised questions about his psychological state. Smith protested his innocence throughout but the verdict was never in doubt. Not for the first time, the jury were swayed by the scientific evidence. Nobody had much doubt about Smith’s guilt but in Spilsbury’s later career, doubts were raised about the validity of some of his conclusions & there were fears that he’d become too fond of his fame. Robins tells the story well with the domestic details that recreate the lower middle-class world of lodging houses & rented rooms. The chilling description of Smith playing the harmonium & singing Nearer My God to Thee as Margaret Lofty lay dead in the bath next door is quite horrible but gives an idea of the cold cruelty of the man. The voices of the landladies, servants, doctors & policemen involved gives an immediacy & poignancy to the sad story of the unfortunate women who met & married George Joseph Smith. When I think of the artists of the 1930s, I think of the Modernists. Art Deco ceramics & jewellery, angular, minimalist architecture & pictures. Alexandra Harris has broadened my knowledge & my definition of modernism in her new book, Romantic Moderns. The subtitle sums up the theme of the book, English Writers, Artists & the Imagination from Virginia Woolf to John Piper. 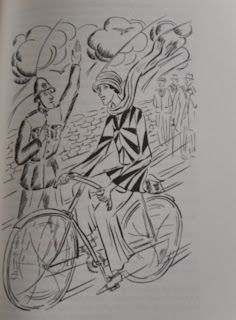 England in the 30s was seen as a bit of a backwater of the Modernist movement. The most innovative work was coming from Europe & the English were portrayed as being in love with the past, especially the rural past. The critic, Roger Fry, was immensely influential in this period. He had organised the famous Post Impressionist exhibition of 1910 & was responsible for shaking off the Victorian past. He was a member of the Bloomsbury Group & Virginia Woolf wrote his biography after his death. The Bloomsbury artists lived in the country & found their inspiration in their houses as well as decorating them with their art & the products of the Omega workshop, another Fry initiative. The theme of the book that I found most interesting was that these artists & writers were recording their vision of England. As the 30s drew to a close & WWII began, the desire to connect with the landscape was very powerful. As well as the abstract artists who were paring their vision down to the barest & most modern minimum, there were also artists recording their joy in traditional scenes of rural life but with a modernist twist. Stanley Spencer’s pictures of Cookham have recognisable portraits of real people but also fantastic scenes like his vision of the Judgement Day when the dead will rise from the parish churchyard. Poets like T S Eliot & John Betjeman wrote of country villages & the London suburbs. Vita Sackville-West’s poems, The Land & The Garden, were celebrations of home & a reimagining of Milton’s Eden. Her retreat to her garden as war approached was a return to Eden as opposed to Milton’s Paradise Lost. During the war, she was planning the White Garden at Sissinghurst, a little bit of defiance in the face of wholesale destruction. The 1930s really were the last opportunity for the past to be recorded & conserved before WWII swept away so many aspects of traditional English life. Florence White was collecting the traditional recipes of England that were rapidly disappearing in an age of convenience food. Her book, Good Things in England, has been reprinted by Persephone, & is full of regional specialities that may have disappeared altogether if not for her work. This is a very inadequate review as there is so much in Alexandra Harris’s book. I’ve just picked out a few of the artists covered in chapters on subjects like the Church, the English weather, village life & the search for a home. I haven’t even mentioned John & Myfanwy Piper, Eric Ravilious, Paul Nash, the Sitwells, Evelyn Waugh & the many other writers & artists with walk-on parts. As well as fascinating reading, the book is beautifully produced, with dozens of illustrations in the text. I want to read Virginia Woolf’s Between the Acts & T S Eliot’s Four Quartets & more Evelyn Waugh. It’s that kind of book that sends the reader off on to new reading paths. Romantic Moderns is a fascinating look at a neglected aspect of English Modernism.